Jamila Mikhail (Жамийла Михаил), or simply Mila for short, was born in British Columbia, Canada in 1996 and now lives in Ottawa, the city of her dreams, with her cats Carling and Squeaker. In 2018 she was one of the people who received the title of Top Writer on Quora and over the years she has also received several awards for her poetry and short stories ever since she started writing on a serious basis in 2011. Mila is currently working towards a degree in human rights and is passionate about social justice. In her spare time Mila also enjoys various hobbies including photography, gastronomy, building toy models of various sizes and studying a variety of things including history, philosophy and foreign languages. She thinks that it’s strange to write about herself in the third person. 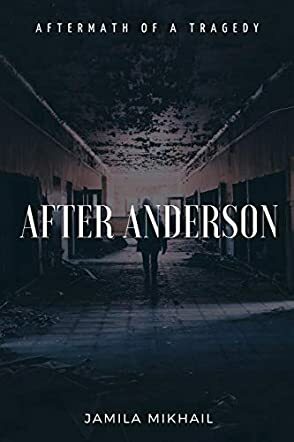 “After you survive Anderson Massey your life doesn’t just pick up where it left off.” After Anderson by Jamila Mikhail wrenches your heart, challenges your soul, tests your personal morality and beliefs. I totally agree with the author’s statement in her commentary, if it “doesn’t bother you there’s something wrong.” We all need to learn to listen to the spoken and unspoken, and really pay attention to those around us. There were many aspects I admired, even more that I appreciated, and a few I could have done without. The story is multi-cultural, a bit political (honestly, my patriotism was battered a bit), yet very insightful. There is no denying, “The universe, with all of its flaws and disasters, was so beautifully and intricately crafted.” This line continues to echo in my mind. In saying that, how does one enjoy a book about a mass shooting? You don’t, but you do hope to gain an understanding of the cause of such a tragedy. Jamila Mikhail reveals the trauma that lingers long after such a violent act. After Anderson is the story of a survivor.